History changed on October 4, 1957, when the Soviet Union successfully launched Sputnik I. The world’s first artificial satellite was about the size of a basketball, weighed only 183 pounds, and took about 98 minutes to orbit the Earth on its elliptical path. That launch ushered in new political, military, technological, and scientific developments. While the Sputnik launch was a single event, it marked the start of the space age and the U.S.-U.S.S.R space race. The story begins in 1952, when the International Council of Scientific Unions decided to establish July 1, 1957, to December 31, 1958, as the International Geophysical Year (IGY) because the scientists knew that the cycles of solar activity would be at a high point then. In October 1954, the council adopted a resolution calling for artificial satellites to be launched during the IGY to map the Earth’s surface. In July 1955, the White House announced plans to launch an Earth-orbiting satellite for the IGY and solicited proposals from various Government research agencies to undertake development. In September 1955, the Naval Research Laboratory’s Vanguard proposal was chosen to represent the U.S. during the IGY. The Sputnik launch changed everything. 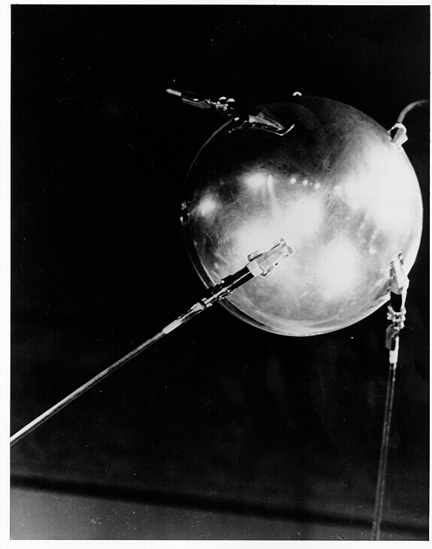 As a technical achievement, Sputnik caught the world’s attention and the American public off-guard. Its size was more impressive than Vanguard’s intended 3.5-pound payload. In addition, the public feared that the Soviets’ ability to launch satellites also translated into the capability to launch ballistic missiles that could carry nuclear weapons from Europe to the U.S. Then the Soviets struck again; on November 3, Sputnik II was launched, carrying a much heavier payload, including a dog named Laika. Immediately after the Sputnik I launch in October, the U.S. Defense Department responded to the political furor by approving funding for another U.S. satellite project. As a simultaneous alternative to Vanguard, Wernher von Braun and his Army Redstone Arsenal team began work on the Explorer project. On January 31, 1958, the tide changed, when the United States successfully launched Explorer I. This satellite carried a small scientific payload that eventually discovered the magnetic radiation belts around the Earth, named after principal investigator James Van Allen. The Explorer program continued as a successful ongoing series of lightweight, scientifically useful spacecraft. The Sputnik launch also led directly to the creation of National Aeronautics and Space Administration (NASA). In July 1958, Congress passed the National Aeronautics and Space Act (commonly called the “Space Act”), which created NASA as of October 1, 1958 from the National Advisory Committee for Aeronautics (NACA) and other government agencies.